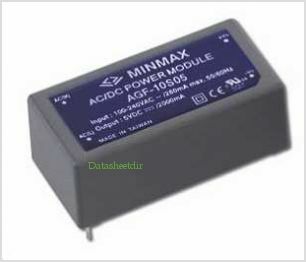 AGF-10 is a 10 Watts series of AC-DC Power Modules These modules have wide input range of 90~264VAC and are available in output voltages of 3.3V, 5V, 12V, 15V and 24V with efficeincy as high as 76% . Other features include continuous short Circuit Protection overvoltage protection, output current limitation, EMC meets EN61000-4(-2,-3,-4), EMI meets EN55022 level B conducted noise compliance minimize design-in time, cost and eliminate the need for external components. The AGF-10 meets IEC / EN / UL 60950-1 safety approval qualifies this product for worldwide markets. The series is a wide variety of applications in commercial and industrial electronic equipment, and MTBF is up to 300,000 hours. By Minmax Technology Co., Ltd. This is one package pinout of AGF-10S03,If you need more pinouts please download AGF-10S03's pdf datasheet. AGF-10S03 circuits will be updated soon..., now you can download the pdf datasheet to check the circuits!